Count by multiples of two at the Dot-to-Dot Zoo to complete the coloring page picture! 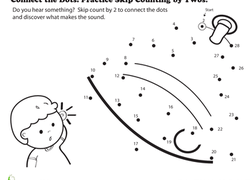 Connect the Dots: practise Skip Counting by Tens! 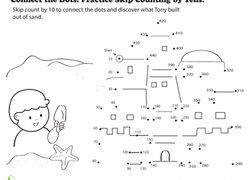 Children skip count by tens to connect the dots and discover the hidden picture. This coloring page dot-to-dot uses skip counting as an unexpected way to tie in multiplication learning and reviewing multiples of five! Skip count by twos in this fun coloring and dot-to-dot exercise that features a hidden animal. Kids will connect the dots to reveal the exotic okapi. Don't Monkey Around, Let's Skip Count! Swing into skip counting by twos! This coloring page dot-to-dot uses skip counting as an unexpected way to tie in multiplication learning with a fun activity.